Major Contract is coming to Steam… with your help. It’s been a while, but it was worth it. Major Contract is almost ready to ship. We made huge changes in art and game-play. The game will come out in 3 platforms, for starters. Major Contract is the best game in the world a game. How difficult to play is it? I’ve come to realize that I am the worst game tester ever; for my games that is. 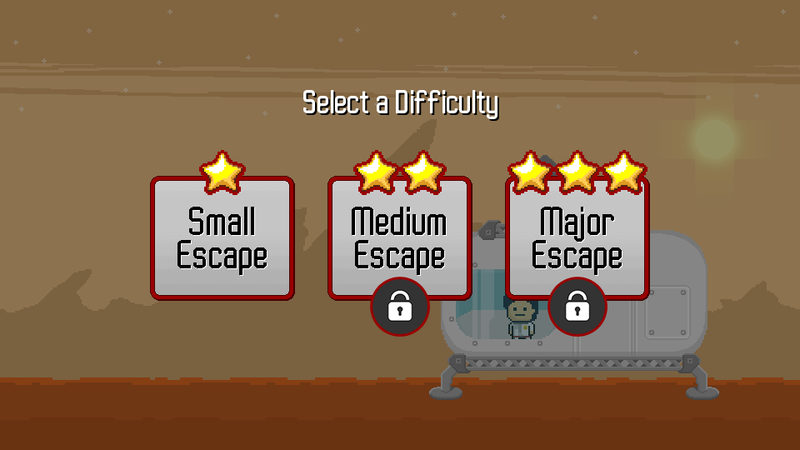 I’ve played Major Escape hundreds, nay, thousands of times. I have escaped the clutches of an exploding planet so many times that my eyes glace over when I see the points screen. 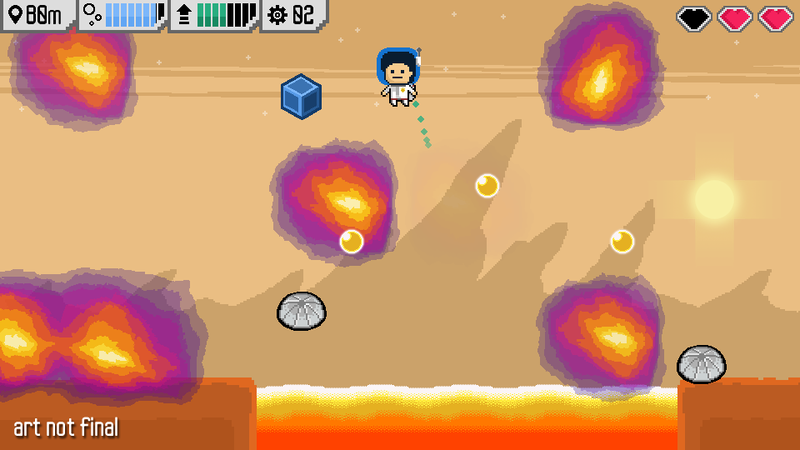 In Major Escape, you need to reach a space rocket that will leave the planet without you if you don’t reach it in time. There was a time, a long time ago, when I could not escape the planet. For almost 2 weeks I kept playing, and kept dying, without being able to reach the rocket. 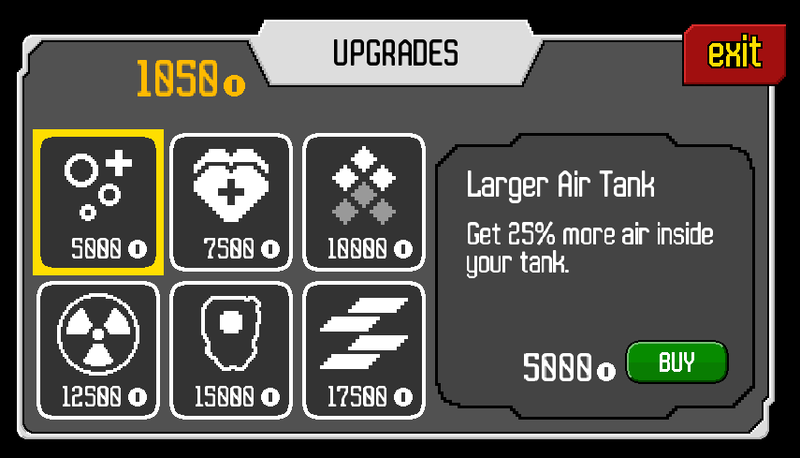 I got better at the game, and today I can beat it in my sleep, which is the kind of progression I want players to have. It also makes me a terrible tester of the game. The game seems easy to me, and I have no idea how difficult it will be for other players. I designed the game to be difficult on purpose, I just don’t know if it’s so difficult to the point of being unfair. It’s been a few weeks of slow progress. At least it feels slow. Major Escape is still in closed beta and I’ve been mostly working on menus and killing bugs. This means that the game looks almost exactly the same as it was two weeks ago. That’s why it feels like there has been no progress. It’s not fun to work fixing bugs and making your menus look better and work better, but it’s necessary work, so I’m getting through it. All of this means that there is not much to talk about the game, at least not at this stage. My Twitter account and Facebook page have been a bit more silent than in the previous weeks when I started promoting the game. Still, I need to keep the conversation going, but how do I do this? According to several online articles, I should be posting and “tweeting” regularly. Some articles recommend that I add to my posts an action shot (video or picture) showing the game’s progress. It makes for a more interesting read. 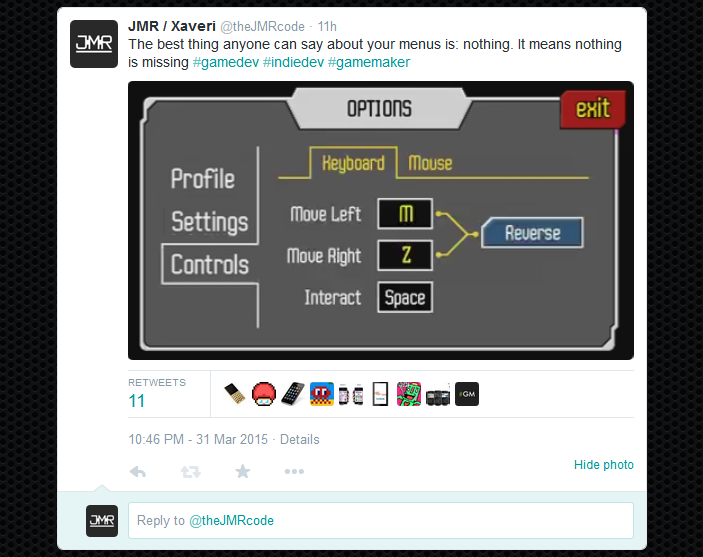 Oh and plenty of hashtags ( #indiedev #gamedev #gamemaker etc.). I’ve been doing all of these things, for weeks, and I’ve increased my Twitter followers by 2 (a 200% increase over the previous month) and my Facebook followers by cero. This is what articles call an “action shoot”. Menus, really interesting stuff huh? There comes a time for every game where the “game” part takes the back seat and the “app” part kind of takes over. I’ll explain in a moment what I mean. 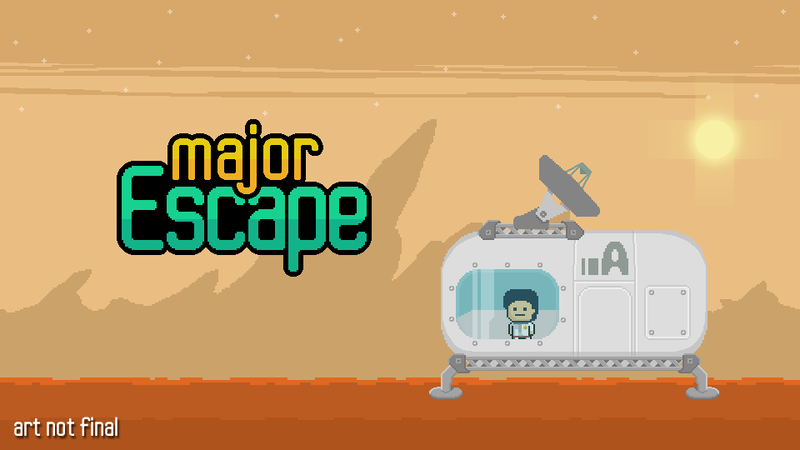 Last week my latest game, Major Escape, reached closed beta status. A very select few testers are playing it and soon it’ll become an open beta. To get the game to beta, not only the main design and mechanics of the game have to be implemented, but also the user interface, menus, screens and in my case, the Leader-boards and Analytics for the game. Those last items is what I mean by the “app” part. At some point I had to stop doing game, art and sound design, to deal with leader-boards and a comprehensive way to gather data from the testers, so that their time with the game could be used in the best way possible to make the best game possible. This has nothing to do with making a fun game, and everything to do with making a solid app. Take this for example: text input. I want players to be able to write the name of their character in the game. If you are playing on PC, that is not a problem, everyone has a keyboard. In mobile devices however, that can be tricky. I was able to find an extension for Game Maker that allows me to call for the virtual keyboard on the device so problem solved, right? Nope. It only works for iOS and Adroid. I also want to develop this game for Windows Phone 8 and I don’t have a way, that I know of, to call for the virtual keyboard on this platform.